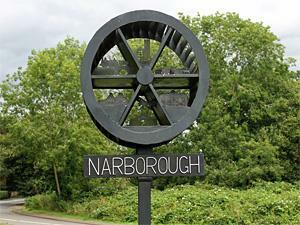 Narborough01553 763044work VillageNarborough is situated in the Nar Valley, with the river Nar flowing through on its way to the River Great Ouse at King’s Lynn which is around 10 miles away. The village features some impressive buildings including Narborough Hall, set in eighteenth century parkland by the River Nar and Narborough Mill built around 1780. Within the village, All Saints church is largely a 15th century rebuilding of an earlier church, extensively restored in the 19th century. Narborough has a village post office, pub/restaurant The Ship Inn and is also popular for people visiting Narborough Fisheries which includes five fishing lakes, fed by the chalk stream waters of the Rive Nar, offering fishing opportunities and a smokery. Situated in the old Methodist Chapel there is a museum and heritage centre full of interesting exhibits, photos, displays and documents relating to the village's rich history. The Nar Valley provides lovely walks west towards King’s Lynn or east towards Caste Acre.